Analytics education in India has come of age. While the area continues to expand with new courses and institutes entering the market, some of the older and more mature players in India have started to make a mark on international stage. First are the traditional B-schools and universities that offer an Analytics / Big Data degree course within one of their schools. Second are the organizations that work in this area and come up with professional certifications; the likes of SAS, IBM, Cloudera, EMC, etc. Third are academic institutions and bodies that deliver specialized analytics courses. In India, this category is most popular and vibrant for a variety of reasons. Premier institutes like ISB, IIMs, etc. who have started Big Data certification courses fall under this third category. Within this space, International School of Engineering (INSOFE) has been amongst the earliest starters and a highly-respected name. Their flagship Certificate Program in Engineering Excellence (CPEE) in Big Data Analytics & Optimization stands out as a unique offering. 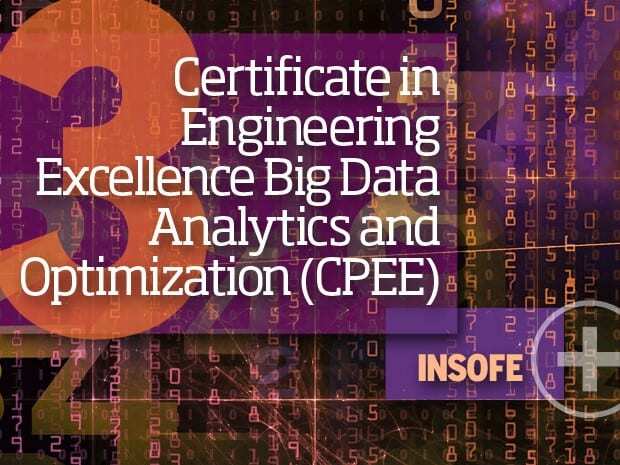 Recently, INSOFE’s CPEE was ranked 3rd globally and 2nd among academic institutions for Big Data certifications that “Pay off” by the authoritative CIO Magazine; it is worth noting that INSOFE’s CPEE is sandwiched between Columbia University’s certificate program at #2 and Stanford University’s at #4. Being the only institute outside the US to be listed in this review is a testament to its adherence to highest global quality standards. Interestingly, some of the other big and active names in the industry and academia did not make a cut into this list, including IBM, SAS, Northwestern, UC Berkeley, etc. INSOFE stands at No. 3 on this list, which in itself is an evidence of what INSOFE has been claiming for years – that its curriculum, pedagogy and faculty matches that of global standards. Indeed, INSOFE is the only institute in Asia whose CPEE program is certified by the prestigious Language Technologies Institute (LTI) of Carnegie Mellon University (CMU), USA for the quality of Content, Pedagogy, and Assessment. For more on INSOFE’s CPEE program, visit http://insofe.edu.in/init/default/cee_program_features. In addition to the now globally recognized CPEE program, INSOFE also actively does corporate training, counting Vistakon (a Johnson and Johnson company) in the US and HP, Microsoft, Tatas, Broadridge Financial Services and many others in India among its prestigious clientele. INSOFE also helps organizations of all sizes build Centres of Excellence in Big Data Analytics. Its mentors actively consult with companies to build Analytics products and work on challenging business problems using novel algorithms, which also helps them bring the cutting-edge real-world experience to their classrooms. Also Read Still making business decisions intuitively? It’s time to use Analytics. INSOFE’s world-class mentors pool their vast expertise and experience having studied, worked or consulted with some of the best institutes (Stanford, MIT, CMU, UPenn, Johns Hopkins, etc.) and Fortune 50 companies. Their researchers are engaged in active research to develop tools for analysing, forecasting and predicting accurately from high-dimensional, unstructured and really large data to solve pressing industry problems. They bring in interdisciplinary approaches from engineering, mathematics, management, social sciences, etc. to provide the most effective solutions. Earlier in 2014, INSOFE entered into collaborative agreements with well-known US Universities to offer unique world-class graduate programs in Data Science/Business Analytics/Big Data Analytics. The program’s most recent effort to expand and enrich its offerings has resulted in an unprecedented collaboration with three American universities: Bowling Green State University, Drexel University and Benedictine University, with more in development. INSOFE’s students get scholarships for pursuing MS in these collaborating universities followed by career services by INSOFE’s industry partners in the US. INSOFE was established in 2011 by 3 entrepreneurs: Dr. Dakshinamurthy V. Kolluru, Mr. ASLG Kumar and Dr. Sridhar Pappu. Getting to #3 in the world within 3 years shows that Team INSOFE’s achievements should be replicated by others to bring Indian education further global recognition. INSOFE’s stated vision is to build a Stanford in India and they seem to be progressing well on the path to achieving this goal.